Many musicologists believe the song to be at least as old as 1820 and this is a discussion best left to them than in this page. The song did make its way into other ships and into the minstrel shows of the 19th century, and is likely to be the most well known sea song today. The verses reflect various ways imagined to punish a sailor reporting on board ship but still intoxicated, and many verses today are created on the spot by performers to reflect current topical events or simply lines to gross out the listening audience, while there are versions softened greatly for audiences of children. Below are lines of mixed origin, from traditional to recent. Make ‘im stand a piss to the winward. 3x, &c.
Put him in the long boat till he’s sober. 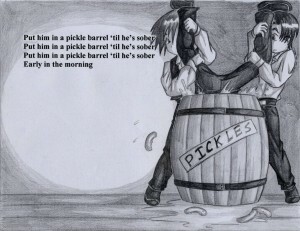 Lock him in the guard room ’til he gets sober. Make him the captain of an Exxon tanker. Put him in the scuppers with a hose-pipe on him. Pull out the plug and wet him all over. Tie him to the taffrail when she’s yardarm under. Tie his pecker in a rolling half-hitch. Put him in charge of an off shore oil rig. Heave him by the leg in a runnin’ bowline. Put ‘im the bilge and make ‘im drink it. Give ‘im a dose of salt and water. Shave his balls with a rusty razor. Give ‘im a hair of the dog that bit him. Put ‘im in a leaky boat and make ‘im bail ‘er. Give ‘im a taste of the bosun’s rope-end. Soak him in oil till he sprouts a flipper. Put him in bed with the captain’s daughter. Have you ever seen the captain’s daugher? Oh, my, what an ugly daughter!! Lock ‘im in a room with Dolly Parton. What do you do with Dolly Parton? (tittie motor boat sound) with Dolly Parton!